And who else deserves spot 8 then our tsundere Aika? 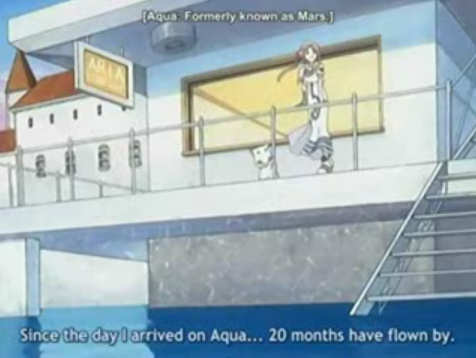 The first friend Akari makes on Aqua, Aika is 16 when they meet. Aika is a Pair and then Single at Himeya Company. She is the only daughter and heir of Himeya’s owners, but does not enjoy the distinction as she feels the company’s employees fawned on her too much. Aika speaks bluntly and often responds to Akari’s idealistic comments with “Embarrassing remarks are not allowed!” (恥ずかしいセリフ禁止!, Hazukashii serifu kinshi!?). Despite their contrasting personalities, she gets along well with Akari, and later with Alice. She is proud of her gondola skill as an undine, and can be very competitive about it. She also greatly admires Alicia, and finds any excuse to visit Aria Company—and once says that if not for her family obligations, she would join Aria Company. 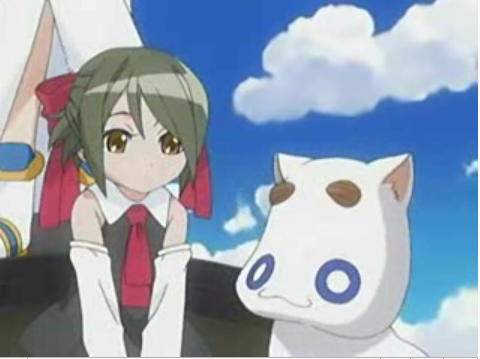 Over the course of the series, Aika develops feelings for Al. In chapter 58, Aika becomes a Prima, taking the title “Rosen Queen” (薔薇の女王, Bara no Joō?, lit. “Queen of Roses”). She takes charge of a newly opened Himeya branch office, in preparation for one day taking on the whole company. 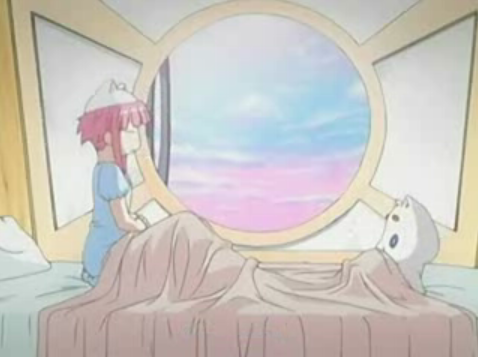 Things start off with Aria-sacchou waking up, he opens Akari’s window and sniffs the air, then goes back to sleep. A small breeze blows through the window waking Akari. She realizes Aria-sacchou is asleep at the foot of her bed. She tells him good morning, and he responds “Ohio-moshimoshi.” Alicia leaves to work, leaving Akari alone with Aria-sacchou. Akatsuki calls and teases Akari, making her flustered. Akari then tells us how she came here and why. Then a small girl calls and asks for Alicia who isn’t here. 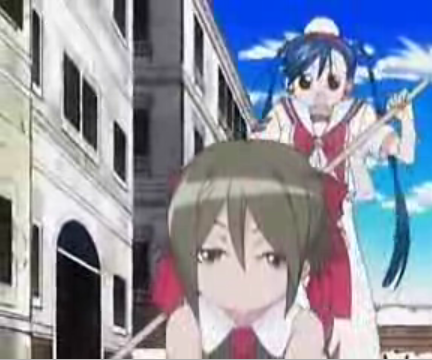 She wants to ride on a Gondola but Akari can’t let her because she’s an apprentice. Akari then goes to start practicing. She sees a girl in her boat. 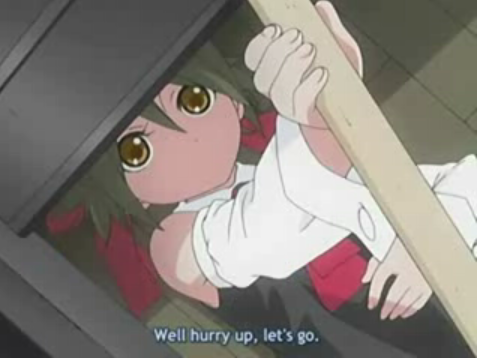 She tells Akari to hurry up so they can leave. Akari tells her she can’t bring her along because she’s still an apprentice. 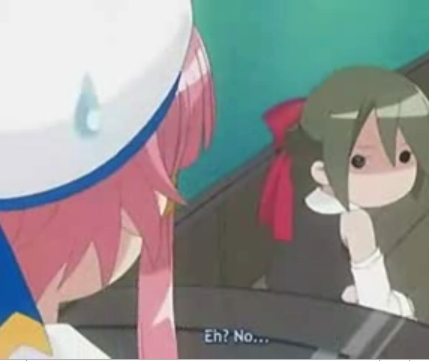 Akari begins to protest but the girl says she’ll scream. “Help…Kidnapper…Things like that.” She makes Akari be her friend. Reluctantly Akari takes her along, like I said reluctantly . The little girl is looking at Aria-sacchou who is rolling around in a bowl. Akari tells her that’s how she knows it’s rocking too much. The little girl repiles. 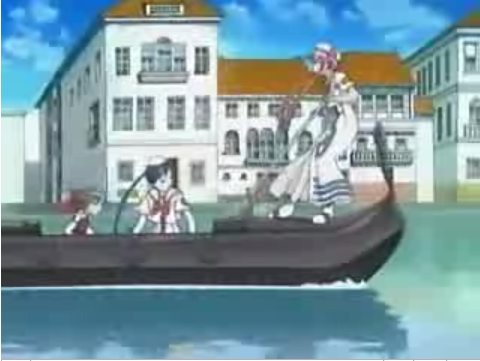 “But it’s rocking.” They go into Neo Venezia where Akari asks the little girl if she likes gondolas. She says it doesn’t seem like it. She tells her they’re slow. 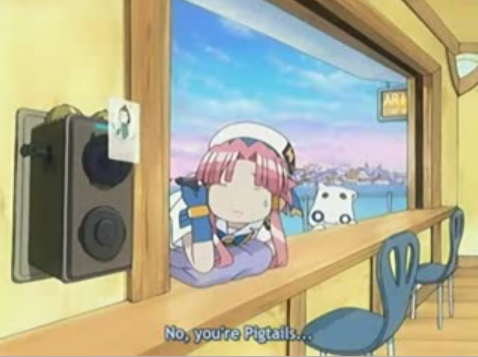 Akari then thinks that she might be the person who called her. 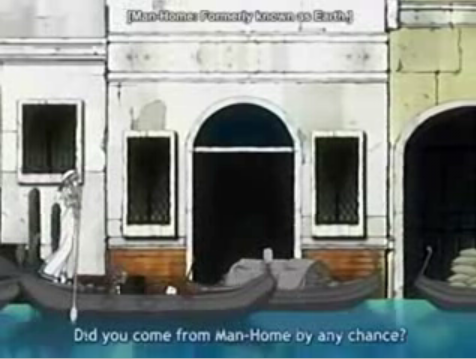 She aks if she comes form Man-home. 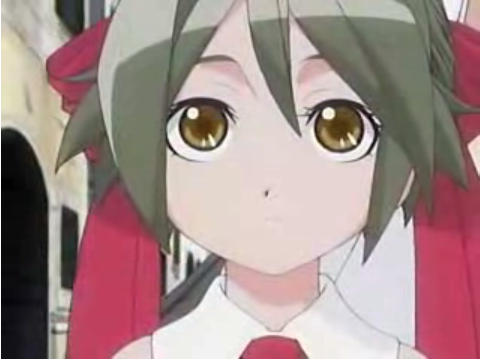 (Earth) The little girl does infact, just like Akari. They talk for a bit about neo-venezia, etc. 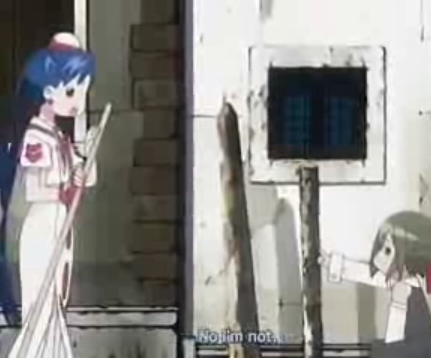 They exchange names the little girl being Ai. She asks why she was on her gondola. Ai asks if she’s checking up on her. 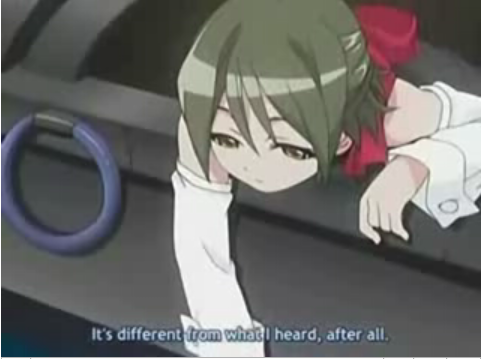 Ai tells Akari it was different from what she heard. Like she thought. The two run into Akari’s friend, Aika(I’m sensing an A theme here. You?) 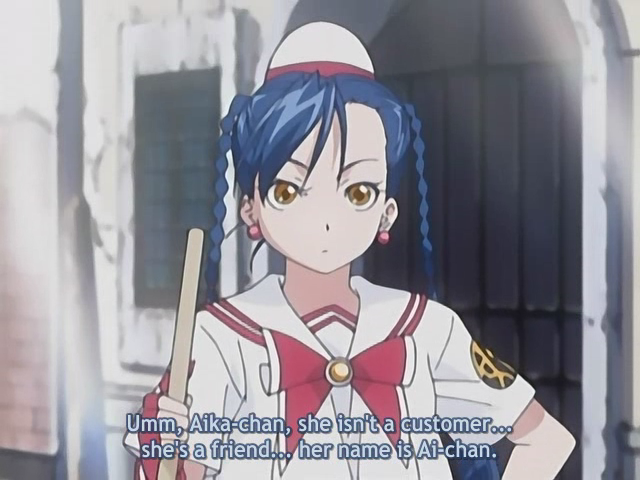 Akari tells her Ai is a friend, NOT a customer. Aika asks if she’s a free rider. Aika tells Ai to hurry up and get off. Ai doesn’t but asks which one of the two is better. Aika tells her it would be her. 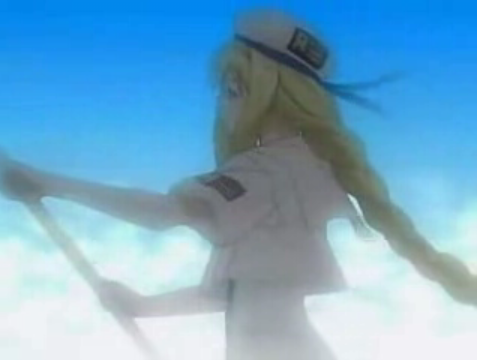 Ai tells her to row, but Aika asks why she should. Ai tells er, Friend. Then Aika tells her no I’m not. 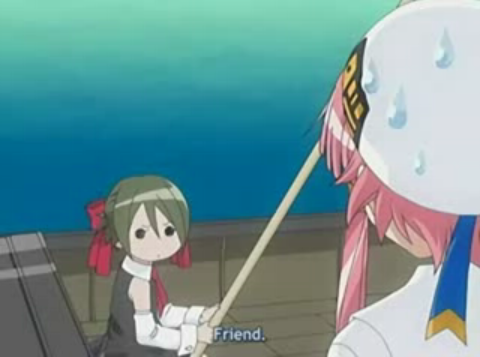 Akari says it’s OK to be her friend. But Aika asks what this means. Akari tells her they’ve gotten to know her know. Ai gives her a confused look. 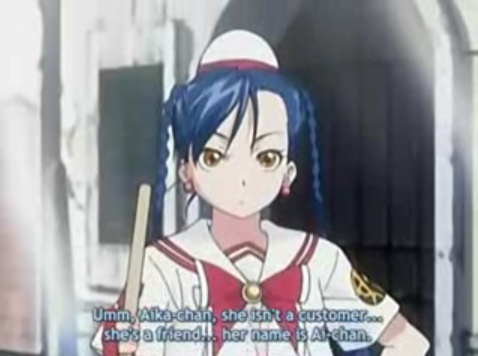 Akari tells Aika to go see Alicia with Ai and Her. Aika goes with them. 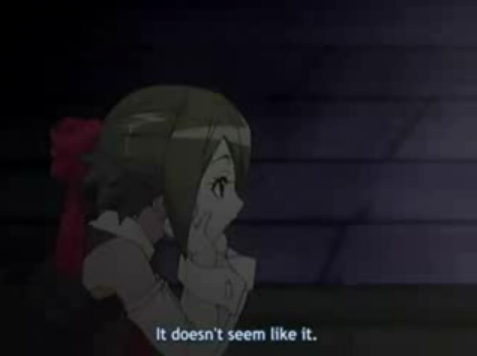 Akari tells Aika she really loves Alicia. Aika replies. “Yes.” Ai says it’s rocking after all, making Aika mad. She tells her Practicing and time is Himeya’s motto. 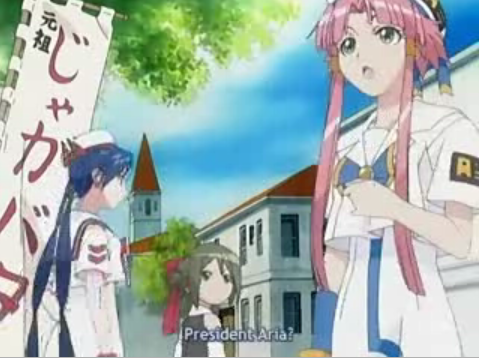 Akari begins going on a history lecture about Aqua, Aika asking her what she’s doing. 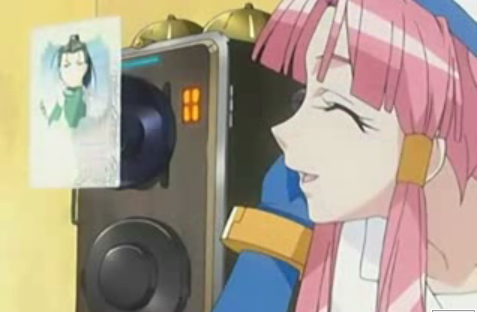 Akari tells Aika she wants Ai to come to like Neo-venezia. Ai asks if they like the city, which they do. Of course. Akari tells them why she came here. She tells her about miracles, something like that. Akari tells Ai that their meeting was a miracle too. Aika says her famous line”Embarrassing remarks are forbidden.” Akari see’s a buttered potato stand and they stop to eat some. Aika tells Akari even though she’s a freerider she has money. Akari see’s that Ai is not eating her’s. She ask’s why. Ai says that it’s so big she can’t eat it. After a bit she likes it, making Akari happy. 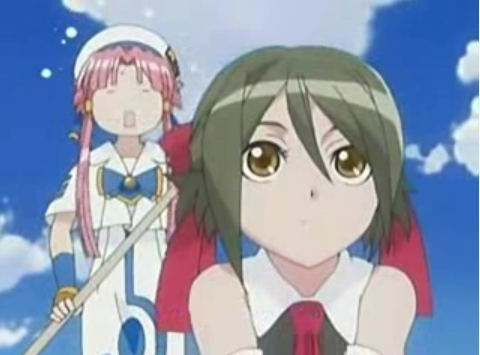 Aria-sacchou is looking at a pole and scares a bird off of it so he can get on it. He falls off of it. At the buttered potato stand they give back their bowls and Ai says it was delicious. 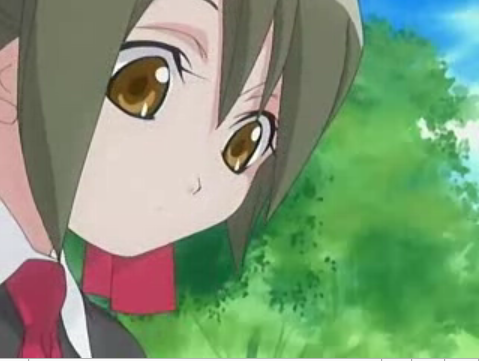 As they’re getting ready to take off, Akari notices Sacchou is gone. 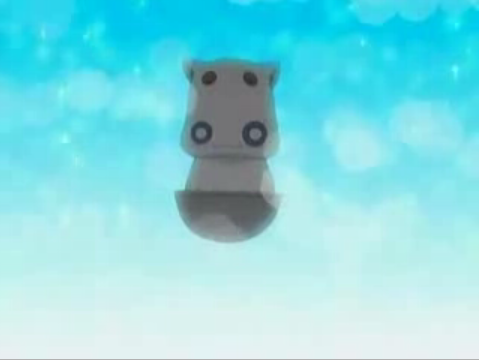 Ai see’s him floating off, far away. 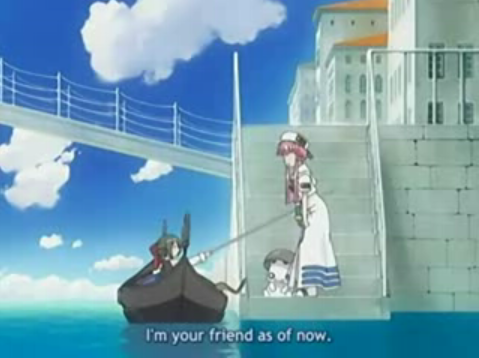 Akari begins to row, when Ai asks shouldn’t Aika row? 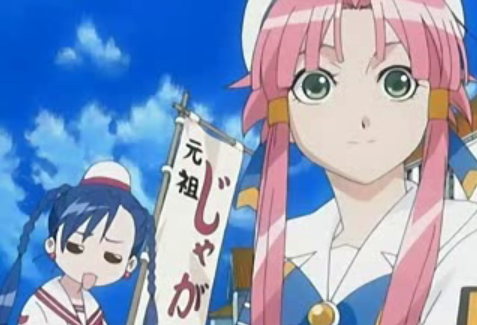 But Aika says Akari should row. 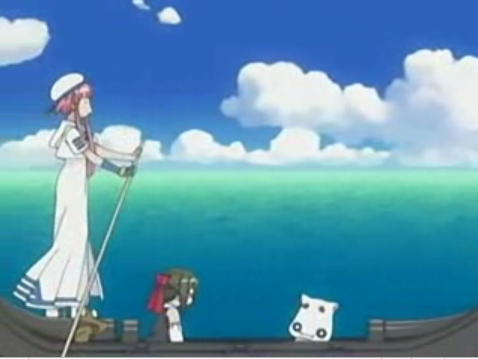 Ai realizes Akari is rowing backwards. Aika says Akari used to practice to row backwards. Unfortunately a bg ship blows them of course, sending them sideways. Alicia suddenly appears. 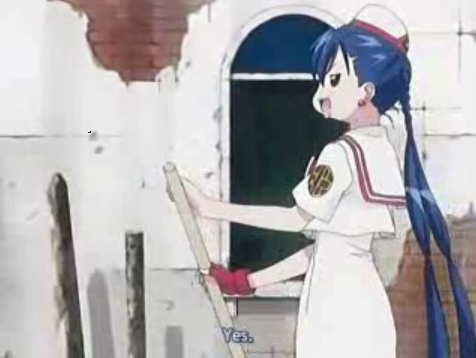 Alicia flips her paddle and saves Aria-sacchou. 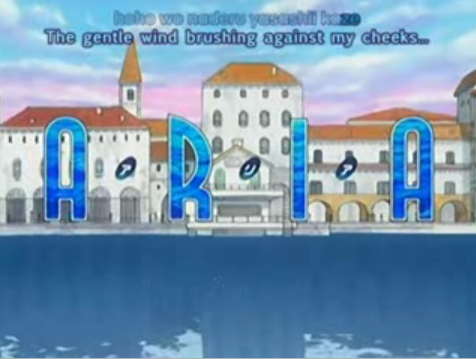 After getting Aria-sacchou back Ai tells them her sister once came back from her honeymoon and bragged about neo-venezia,Ai wanted to see it too. 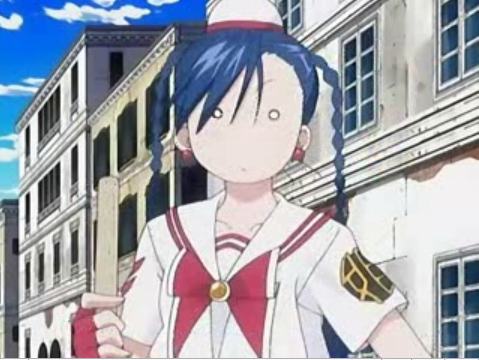 Akari says Ai’s sister wasn’t bragging just wanted everyone else to see neo-venezia too. 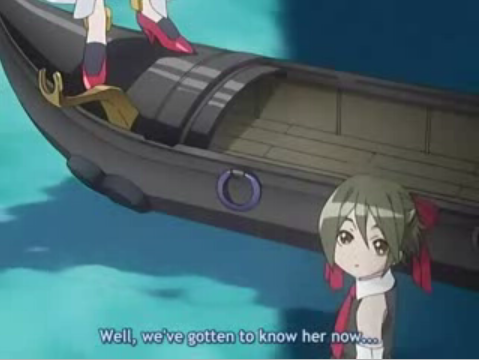 Bakcat Aria company Ai tells Akari to hurry up and become a Undine. She gives Akari something before leaving, to give to Alicia. A photo of her sister. Alicia said the couple fought on her gondola, and she was glad to see them happy again. I have WAY too much screencaps. Sorry. Awww. Aria-sacchou sometimes I love you, sometimes I wanna kill ya. Which one first today? KILL! Alicia my favorite character. Your not seen much and when you are seen your too nice. Akatsuki-san…………………. Aqua is wonderful. 24 months is a year. I wish I could live there…. AS IF. Oh wow a small girl is calling asking to ride a gondola… What to do? Hmmmmmmmmm . 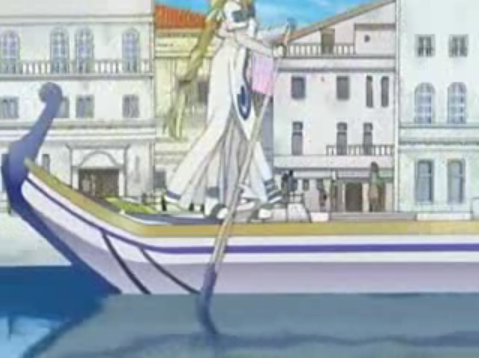 Oh wow look a girl is in my gondola…. Who is she? Is she one of Lulu’s family? Hey… She’s kinda cute. Great now I sound Like a perv. I made this one big because it’s cute. I’ll scream. Kidnapper…. 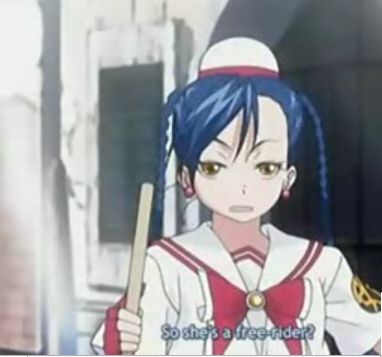 Someone… Help me…..
Aria-sacchou I’ll bet Ai want’s to kill you too. Poor Akari. She can’t get anything right. Honestly… What am I going to do with you Akari? It’s still rocking. Ai your the most reasonable girl in this anime. So cute.! My otaku level is over the top! Aria-sacchou this is when I want to kill you! Presenting the goddess of th water, Alicia.